Sunday morning, 10am, the Boulder Theater. 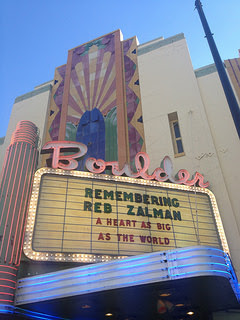 As the crowd gathers in this beautiful art deco building, Reb Zalman’s voice is pouring out of the speakers, singing songs and niggunim, while a slide show of his life is cascading across the big screen. Hearing Reb Art (Green) talk about Reb Zalman, his importance, his work, his legacy, is incredible. “When his soul reached heaven,” he says (or something along these lines — I’m paraphrasing), “God did not ask him why he was not Yochanan ben Zakkai, founding a new way of learning in a time of paradigm shift. God did not ask him why he was not the Arizal, master of kabbalistic wisdom. God did not ask him why he was not the Baal Shem Tov, bringing devotional practice to the people. God did not even ask him why he wasn’t Reb Zusya, the holy fool!” Because Reb Zalman was all of these and more. Throughout the event, spoken word reminiscences are interspersed with song. Hearing Hazzan Richard Kaplan sing is incredible, especially when he sings the Baal Shem Tov’s Yedid Nefesh and closes his eyes and is visibly transported to other realms. He takes us there with him, and I remember how Reb Zalman used to love to listen to him bringing life to these old and deep Hasidic melodies. His singing becomes the vehicle which carries us aloft. Singing along with Shir Yaakov and the band as they play his Or Zarua is the first thing that really cracks my heart open. “Light is sown for the righteous, and for the upright of heart, joy” — surely Reb Zalman sowed seeds of light wherever he went, and now in whatever realm his soul inhabits, surely there is joy. The whole theatre is singing, and I know I am not the only one singing through tears. That’s not the only time that weeping overcomes me. When Rebbitzen Eve gets up with the piano and band and sings “Here’s to Life,” by Artie Butler, a torch song of love and embracing life to the fullest — when she walks over toward his big rebbe chair, sitting in a spotlight at the edge of the stage, empty but for the rainbow tallit he designed — my tears fall again. I cannot begin to imagine the depth of her loss. When we watch the (never-before-broadcast) video of the address “The Emerging Cosmology,” given at the Roundtable Dialogue With Nobel Laureates in Vancouver ten years ago (which explains why His Holiness the Dalai Lama and Bishop Desmond Tutu and other luminaries were seated on stage), I laugh and clutch at my heart. His fur streiml! His joking about looking like someone from Fiddler on the Roof, and then breaking into song! His Star Trek “mind meld” answer to the teenaged girl who asks him a question! And in between all of these sweet things, a powerful teaching about post-triumphalism and organismic thinking and how we need to care for our world. Murshid Allaudin Ottinger, a senior dervish of the Sufi Ruhaniat International, leads us in the zhikr. The full band plays: piano, violin which calls out like a human voice in jubilation and in grief, clarinet soaring high, three hand-drummers on different drums. The entire building is packed and we all rise and we sing and the melodic lines braid together. We are hand in hand, or arms around each other, or standing separately but swaying together as we sing: to one side, to the other side, forward. In the name of the One. Peace, God of peace. May his soul be bound up in eternal life. The zhikr builds and builds and I can feel how our singing and our prayer and our memories and our love are lifting Reb Zalman’s neshamah higher and higher. When the event ends my face is wet with tears and my heart is as wide-open as it can be. I am out of words, but I am so grateful, and so full of love. This is an excerpt from the post Glimpses of the Remembering Reb Zalman Shabbaton at Velveteen Rabbi. Rabbi Rachel Barenblat, author of Waiting to Unfold and 70 faces: Torah poems, is a member of the ALEPH board of directors. Posted in Reb Zalman. Bookmark the permalink.